All three products use the force of any draught to shut more firmly, so the harder the wind blows the tighter they remain shut. All our products achieve draughtproofing without magnets, brushes or springs to force the flap shut, so despite their draught-resisting qualities they will open with the merest presssure. A flyer will go through the Ecoflap and Letterplate effortlessly, and the smallest kitten will have no trouble pushing open the Petflap. 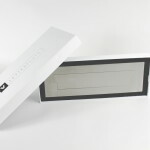 The Ecoflap is the first of our products to be mass produced (but not the first to be developed). 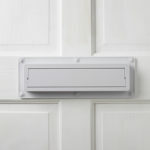 A fit-and-forget draughtproofing measure, you can keep your external letterplate (or treat your front door to one of our elegant Letterplates) and your letterbox continues to work just as it always did but without the annoying rattles, draughts and snags. Postal deliveries glide through with no effort. No crumpled post. No trapped fingers. No torn newspapers. It can open to take a small parcel or entire telephone directory and as the item goes through easily the Ecoflap shuts behind itself and carries on keeping your hallway a draught-freee, even temperature. The Letterplate was the next of our products to be mass produced, but had been made to order for a little while previous to that. Coming to market formally in mid-2016, the Letterplate is more of an architectural draughtproofing element, designed to enhance any door it graces aesthetically as well as providing all the same energy efficiency benefits as the Ecoflap. 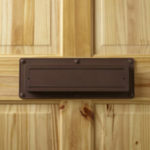 The Letterplate is popular with postal delivery workers as it doesn’t require a flap to be lifted. 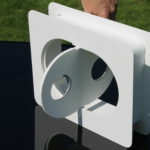 The flap pushes in easily and lefts up to accommodate large parcels. Used together with an Ecoflap, the Letterplate is a tremendously effective barrier to noise, draughts and rain with no compromise on appearance. The Ecoflap and Letterplate can be bought together for a discount – see the shop for details. The Petflap was the first product to be developed by our lead designer Richard in the C20th century and many bespoke versions have been in use all around the UK ever since. Richard was irritated by the noise his cat’s pet door made and felt he could do better. 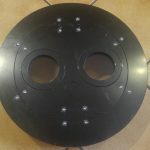 The Petflap was the result, but it wasn’t until late 2016 that it was mass produced. The Petflap cuts draughts and eliminates rattles and banging but is easy for even a kitten to open. It’s gentle on your pet’s paws and tail but hard on breezes and gusts. Made in the UK and designed to last, a Petflap will make life more comfortable for you and your pets.